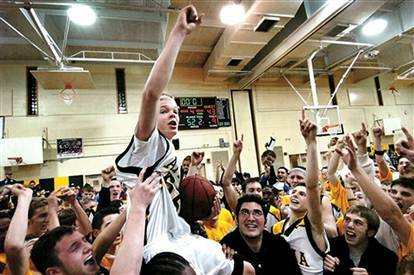 Jason McElwain, who has autism, scored 20 points in four minutes in a high school basketball game in 2006. AP Photo/Eric Sucar. One of my articles has been published in the new issue of Autism Spectrum Quarterly magazine. It’s about sports and exercise for children with autism, and how sports can help kids improve their social and cognitive skills. A high functioning child with autism may be able to play in a typical league with help from a “shadow,” or a child can participate in organizations like Special Olympics or Kids Enjoy Exercise Now (KEEN). Even playing catch during play dates can be a start. Sports can be a great way to help kids with autism make friends, improve communication, and above all, have fun. Four years ago, Jason McElwain, a teenager with autism, became an overnight sensation by scoring 20 points in four minutes of action in a high school basketball game. . . . Regardless of whether children with autism are high functioning like McElwain, or are less advanced cognitively, playing sports can have profound effects on several aspects of their lives. For example, sports can help kids with autism gain confidence, improve social skills, and develop better coordination. Improvements in balance and motor planning skills often go hand in hand with progress in cognitive function, academic achievement, and organizational skills. 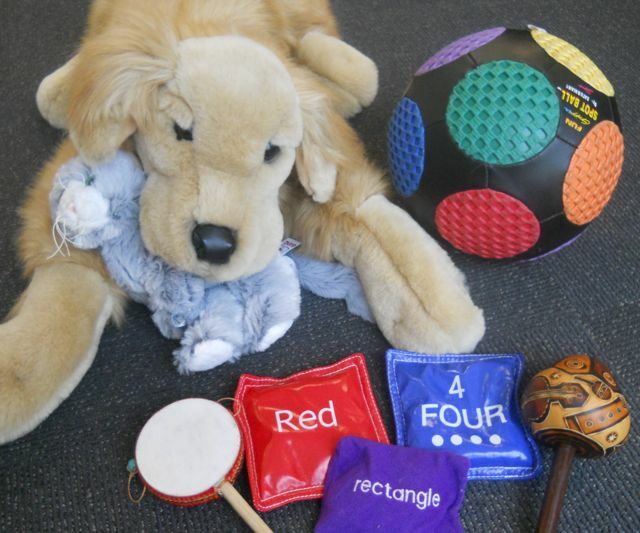 Stuffed animals, musical instruments, balls, and beanbags with text can be used during Floortime activities. Photo by Mike Frandsen. Integrating developmental teaching models into behavioral approaches can help children with autism generalize skills so they can apply them in real world, natural environments. Dr. Stanley Greenspan’s Developmental, Individual Differences, Relationship-based (DIR) model of autism therapy aims to improve social, emotional, and intellectual abilities in a way that is meaningful for the child rather than focusing on isolated skills and surface behaviors. Applied Behavior Analysis (ABA), considered the gold standard for autism therapy, is a proven method of teaching children with autism functional and cognitive skills. One of the criticisms of ABA, though, is that it can result in answers that are scripted. Children with autism need both structure and meaning when they learn. Therefore, combining elements of ABA and DIR may result in the best opportunities for success. To read the rest of my article on Examiner.com, please click here. The Washington Nationals announced Friday that rookie phenom Stephen Strasburg has a significantly torn ligament in his right elbow and is expected to undergo Tommy John surgery. The surgery would most likely sideline Strasburg for 2011 season although it is possible he could return late in the year. Strasburg, called one of the best pitching prospects in history, finished his rookie season with a record of 5-3, an ERA of 2.91, and 92 strikeouts in 12 starts. His strikeout to walk ratio was an incredible 5.4 to 1. Strasburg’s fastball was clocked over 100 miles per hour and his curve baffled experienced hitters. Strasburg pitched 123 innings this season and the Nationals had planned to shut him down for the year after 160 innings. The 22-year old rookie right-hander created a buzz around the Nationals that hadn’t been experienced in their six years of existence, with attendance up significantly during Strasburg’s starts. When Strasburg started at home, the Nationals averaged 34,270 fans, nearly double the 17,190 the Nats averaged for other games. 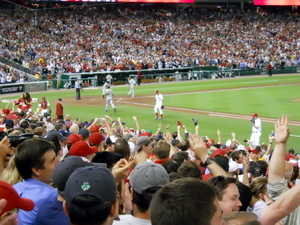 Strasburg was spectacular in his major league debut June 8, striking out 14 and walking none in seven innings in a 5-2 win over Pittsburgh at Nationals Park. For the rest of my article on Examiner.com, please click here. Washington’s ninth inning rally came up short as the Nationals lost their third straight game, 5-4 to the Chicago Cubs on a rare cool August evening Tuesday at Nationals Park. With temperatures in the 60s, starter John Lannan (5-6) gave up two home runs to the bottom half of the Cubs’ lineup. Meanwhile, Cubs starter Carlos Zambrano (5-6) pitched seven innings, striking out eight, and giving up just one run. In the second inning, former Nat Alfonso Soriano hit a high three-run homer to left field, his 20th, off a Lannan breaking ball. I’ve decided to retire my “Statement to responding to email” (mikefrandsen.org/2009/01/05/no-reply-at-all/) from my email signature. Since I put it up there it hasn’t increased the percentage of people who respond to emails that require a response. Luckily most people respond when a question is asked or an important email is sent. As for the rest, I guess I’ll just have to guess whether a non-response means the person was just busy and overlooked responding, or whether I am supposed to read between the lines and figure out that when people don’t respond it means they disagree with the email or something. Also see mikefrandsen.org/2010/05/14/responding-to-email. Educational DVDs may help children with autism over the age of two learn basic concepts, but parents should check with their physicians for guidance on what age is best to allow their children to begin watching TV. Consulting with other parents, teachers, and therapists can also contribute to an informed decision. Parents should note that TV should be limited or not shown at all to children under the age of two, according to the American Academy of Pediatrics. Several studies, including one published in the February 2010 American Journal of Epidemiology, have concluded that hyperactivity and inattention are associated with TV exposure before the age of two. Picture books and books on emotions can be used to introduce reading to children too young to watch TV. Stephen Strasburg struck out seven batters in five innings and the Nationals came back from a 3-1 deficit to overtake the Arizona Diamondbacks, 5-3. Strasburg pitched well after his first bad performance of the season five days ago when he gave up six runs to Florida, and Josh Willingham and Ryan Zimmerman homered for Washington. Strasburg didn’t get the victory, though, because of an error he committed in the second inning. After giving up a solo home run to Adam LaRoche, Strasburg took a lightly hit ball by Stephen Drew and threw it over the outstretched arm of the 6-6 Adam Dunn. That allowed Mark Reynolds to score from first while Drew made it all the way to third. Gerardo Parra hit a sacrifice fly to drive in Drew, and the Diamondbacks led 3-0. Sometimes as I’m writing on my laptop, I’ll have a movie on TV on in the background for inspiration. When there aren’t any good movies on, which is about 98 percent of the time, I’ll switch the TV to a series of channels next to each other including the Discovery, Science, and History channels. There are a few more in that area too. There are some really good shows. Sort of reality but dealing with nature. I rank the best of them with a couple of notes below. Man vs. Wild – On a recent show, Bear Grylls killed an Octopus by biting between its eyes, then ate it while it was still twitching. He gets dropped off in places like the Arctic, Northern Africa, and tropical islands and has to live off the land and make it out. That’s versatile. Monsters Inside Me – This is a great show about parasites. People go to the doctor, they dismiss their problems, and later it’s found that they have some kind of parasites. It makes you wonder how often people have them and they go undiagnosed. Rivermonsters – Jeremy Wade goes fishing for giant fish. It always helps to have a dramatic British accent. Deadliest Catch – The camera follows several fishing boats who go off the coast of Alaska to catch crabs. MonsterQuest – It has jumped the shark a bit because so many of the stories are about Bigfoot, but it’s still pretty cool. Through the Wormhole – With Morgan Freeman, they discuss space, time travel, and other interesting stuff. Pawn Stars – Maybe this doesn’t belong here, but it’s a great show. A pawn shop owner works with his father and his son to buy stuff people bring in. Only in real life I never find old junk that I can sell for a lot of money. Examiner.com is going through an “upgrade.” Unfortunately, and hopefully not for long, there are a lot of formatting problems with the articles. They’re working on fixing them. Hopefully everything gets back to normal soon, but I wanted to say that I’m not responsible for the problems if you look at my autism and sports articles. If you commented on the articles, those comments should reappear soon. Children with autism are often notoriously poor at identifying, understanding, expressing, and handling their emotions. Meltdowns and tantrums can be common, and the ability to recover from these outbursts can be elusive. Emotion coaching is therefore a crucial component of any autism therapy program. Helping children with autism deal with feelings should be accomplished not only during play dates and social skills practice, but also during more traditional cognitive and academic behavioral teaching. In fact, an argument can be made that the ability to handle emotions is more important than the ability to excel academically.